Before our wedding day, we met with John to discuss the ceremony. He shared his ideas about what we could include and we shared our ideas. On the big day, we were profoundly moved by how extraordinarily beautiful he took what we shared to eloquently create the perfect moment in our lives. 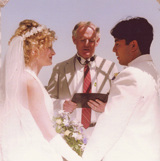 On one of the most important days of our lives, John made our ceremony the most touching and memorable for everyone. Your wedding carries your personal signature and celebrates the launch of your new adventure. You can have a ceremony free from worry and filled with love, inspiration and meaning—an expression of your personal love story. It's a privilege and an honor to officiate the marriage of two people. 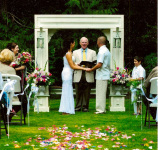 With over 35 years experience officiating weddings I can provide the solid background to give you the peace of mind to experience the celebration of your marriage. I understand how to set the tone that is lighthearted yet meaningful. I've performed wedding ceremonies on beaches and mountaintops, in churches and parks, I've even climbed Mount Rainier with a wedding party to perform the ceremony at the summit. And I've blessed all kinds of unions, gay, straight, young, old, first timers and second-timers.